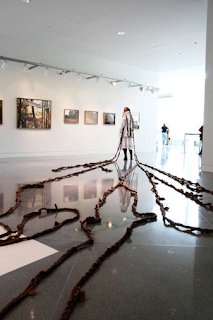 Portland artist MK Guth stands with her braids inside the Cosmopolitan’s P3 Studio. Artist MK Guth's Rapunzel-like interactive performance/installation Best Wishes recently ended its run at the Cosmopolitan Hotel's P3 Studio in Las Vegas. 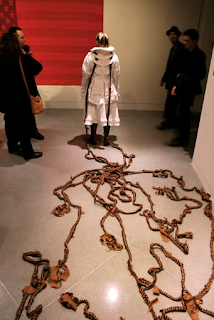 The work invited gallery visitors to write wishes and desires onto strips of fabric that were woven into an ever-growing braid of synthetic, blond hair attached to Guth's head. The braids grew to more than 200 feet, hanging from the ceiling and extending through two rooms of the studio. 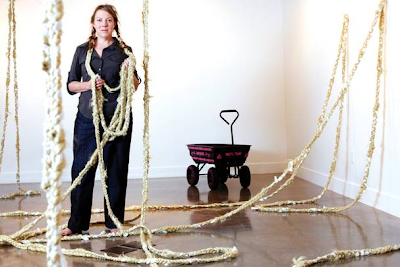 Guth related her work to the way visiting Las Vegas tends to involve a wish, a dream or a hope. People come to Las Vegas to gamble, see shows, shop or experience the fantastical, so Guth asked people to share their wishes on white ribbons she then had braided into her hair. "Some people write one word. Some write a tome...I have the burden, literally, of other people’s concerns." A local newspaper, reporting on the installation, described a tourist from Florida who came to Las Vegas to try and assuage her negative feelings of a divorce she was going through. In the gallery the tourist "ended up chronicling [her feelings], along with her dreams and hopes, on a piece of cloth for Guth. Having them braided into the artist's hair probably won't help them come true but at least it made her feel better." The fictional Rapunzel was trapped by an old witch, but the contemporary Rapunzel is trapped by her own internal dilemmas. In the fairy-tale, hair is the means by which Rapunzel can be rescued from her entrapment and Guth maintains a similar agency for hair in her own work. 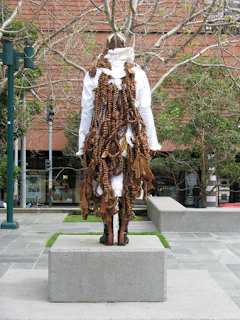 Not only does Guth literally transfer fears, burdens, and wishes onto her own shoulders, but the braids subsume people's wishes and worries via the act of weaving, a common metaphor for life. 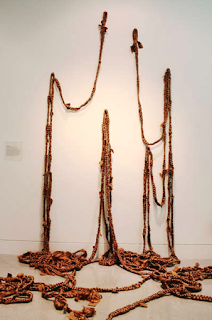 This is not the first time Guth has worked with weaving words into braided lengths of artificial hair extending from her head. 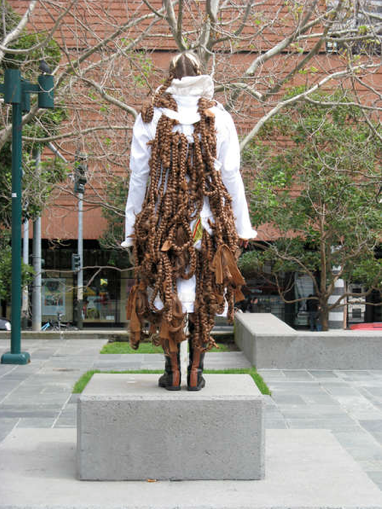 Her 2008 performance piece I Still Feel the Same at the Yerba Buena Art Center in San Francisco similarly asked visitors to write on a piece of paper, however this time their thoughts were about the idea of 'feminism.' The braid was then cut after two days and was presented as an object in the group exhibition The Way That We Rhyme: Women, Art and Politics. For Tiles of Protection and Safe Keeping at the 2008 Whitney Biennial, visitors responded to the question, "what is worth keeping?" The curators described MK Guth as "reimagin[ing] traditional fables and popular fantasies, inserting new, hybrid mythologies into the public realm as vehicles for agency, empathy, and social engagement." While Guth's performance/installations lack a certain sophistication in their execution, there is something inherently pleasing about them. If fairy tales often start with a wish, here it is not some elf who comes in the night to spin straw into gold, but rather our own intentions -- our literal incantations -- that ask to manifest transformation and re-invigorate magical experience.